Wer streamt Jeremiah Tower: The Last Magnificent? Aktuell bei Amazon und Netflix verfügbar. 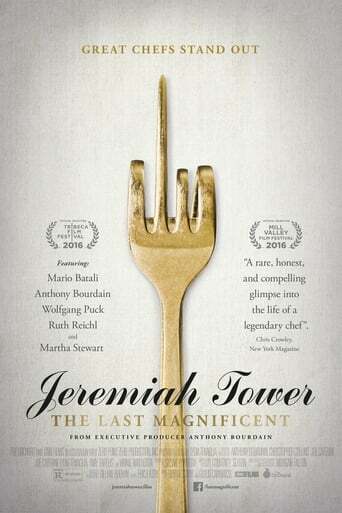 JEREMIAH TOWER: THE LAST MAGNIFICENT explores the remarkable life of Jeremiah Tower, one of the most controversial and influential figures in the history of American gastronomy. Tower began his career at the renowned Chez Panisse in Berkeley in 1972, becoming a pioneering figure in the emerging California cuisine movement. After leaving Chez Panisse, due in part to a famously contentious relationship with founder Alice Waters, Tower went on to ... (weiterlesen)launch his own legendary Stars Restaurant in San Francisco. Stars was an overnight sensation and soon became one of Americaâs top-grossing U.S. restaurants. After several years, Tower mysteriously walked away from Stars and then disappeared from the scene for nearly two decades, only to resurface in the most unlikely of places: New York Cityâs fabled but troubled Tavern on the Green. There, he launched a journey of self-discoveryfamiliar to anyone who has ever imagined themselves to be an artist. Featuring interviews by Mario Batali, Anthony Bourdain, Ruth Reichl and Martha Stewart, this delicious documentary tells the story of the rise and fall of Americaâs first celebrity chef, whose brash personality and culinary genius has made him a living legend. Uns sind aktuell keine Sendetermine für »Jeremiah Tower: The Last Magnificent« bekannt. Wie fandest du »Jeremiah Tower: The Last Magnificent«?